GovDocs is one of the leading providers of labor law posters and business compliance services in North America, with a customer base of more than 300,000 employment locations throughout the U.S. and Canada. After finding LyntonWeb on HubSpot’s list of certified partners, GovDocs turned to us for help with all of the above, and more. 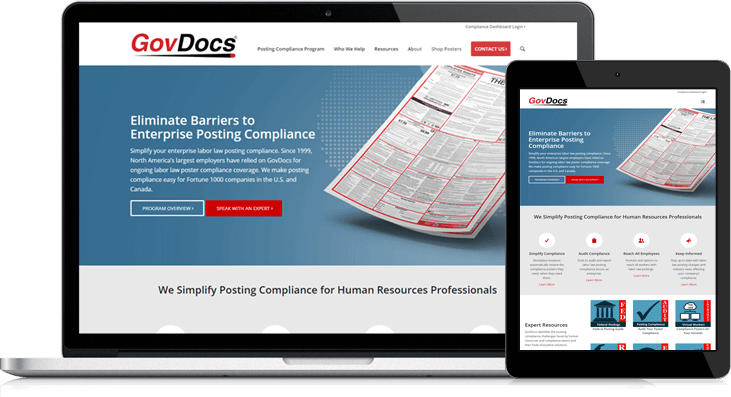 GovDocs wanted to shift the focus of its site from the poster store to the enterprise-level business services they offer, such as a posting compliance program that takes the work out of keeping up with regulations for every location. That said, the redesigned site needed to appeal to the HR administrators and business owners that would view such services as the ultimate solution to their pain points. The site also needed to infuse confidence in prospects that GovDocs was a trusted outsource partner for labor law posting compliance. Thanks to a redesign using WordPress with the HupSpot platform, the revamped site offers a clean design and solid focus on the main offering. Visitors instantly know GovDocs is a complete B2B labor law poster compliance solution, not a B2C online poster shop for one-time purchases. We equipped GovDocs with our custom-built plugin that allows the company to add HubSpot forms into its WordPress pages. We also provided precisely organized templates for various types of content. The templates are functional, allowing for GovDocs to easily build new site pages in the future. LyntonWeb worked with GovDocs to devise a content strategy that included topical content in the form of blog posts and compelling offers in the form of white papers. Both were geared for inbound lead generation and capture. Price quote request forms were also added to capture sales-ready contacts. With a modern look and friendly yet professional feel, GovDocs’ new site makes it easy for visitors to find answers to their questions and solutions to their problems. Armed with fresh content, the marketing team hit the ground running after the site’s launch, publishing new content on the blog and putting out new offers designed to appeal to HR admins and business owners across several states and industries.